Submitted by Raisa Masood on Wed, 01/23/2019 - 17:19. New York, NY – January 24, 2019 – New findings announced today from The Rise of Read-Aloud, the first installment of the Scholastic Kids & Family Reading Report: 7th Edition, reveal that the percentage of parents reading aloud during a child’s first three months is up nearly 50% since 2014, and the number of 6–8-year-olds being read to 5–7 days a week is up seven points since 2016. On February 1st, the global literacy nonprofit LitWorld and title sponsor Scholastic will unite people around the world for the 10th annual World Read Aloud Day (WRAD), highlighting the importance of reading aloud and sharing stories, and calling on everyone to keep progress going. While a majority of families (55%) read aloud 5–7 days a week before a child turns six, this percentage then begins to decline dramatically—even as research shows read-aloud frequency can help shape a young child into a frequent reader. On World Read Aloud Day, students, families, and educators everywhere are invited to tune in at 10:30 a.m. EST to watch a special read-aloud event live streamed on the Scholastic Facebook page. Hosted at Scholastic headquarters in New York City, the event will feature renowned authors Carmen Agra Deedy (The Rooster Who Would Not Be Quiet! ), Ross Burach (The Very Impatient Caterpillar), Sayantani DasGupta (Kiranmala and the Kingdom Beyond), Jarrett J. Krosoczka (Star Wars: Jedi Academy), and Peter H. Reynolds (Say Something! ), who will read excerpts from their books and answer questions about reading, writing, and encouraging a love of stories. Approximately 200 students in grades 2–5 from the New York City Department of Education will be in the audience to enjoy the read-aloud event in person and meet their favorite authors. Globally, millions of people will join in the World Read Aloud Day festivities by also hosting their own unique WRAD gatherings, including school-wide assemblies, local book drives, community marches, and more. Through Skype in the Classroom, educators have the opportunity to register to virtually connect students with authors for special read-alouds. On social media, participants can share snapshots of their special read-aloud moments, books, and ideas using #WorldReadAloudDay. On February 7th, readers everywhere are encouraged to continue reading aloud in recognition of Harry Potter Book Night. Started in 2015, Harry Potter Book Night is an annual celebration in bookstores, libraries, and classrooms dedicated to passing on the magic of J.K. Rowling’s books to the next generation of young readers, as well as celebrating with devoted Harry Potter fans. 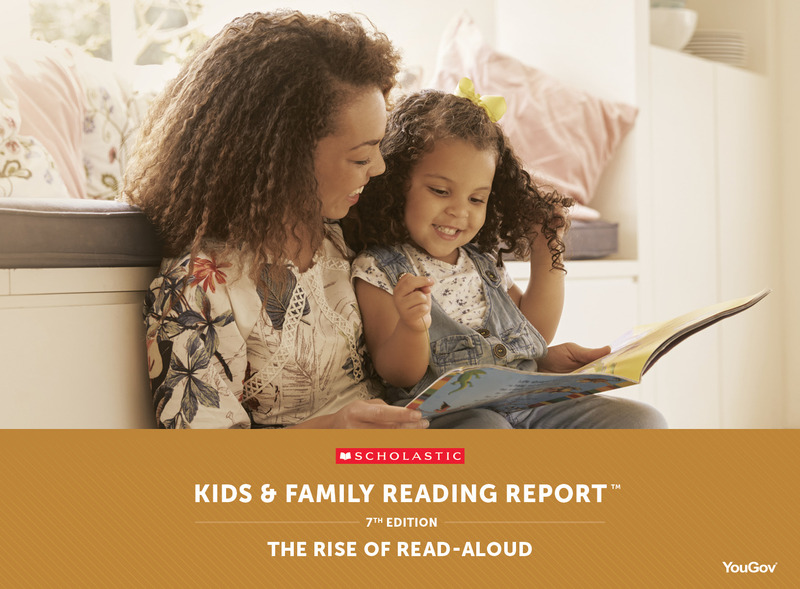 The Kids & Family Reading Report: The Rise of Read-Aloud is the first of three reports encompassing the 7th Edition’s wide-breadth of data. Two additional installments will be released this spring focusing on the latest trends in children’s reading habits, what both kids and parents want in books, book access, as well as summer reading. For more information about Scholastic (NASDAQ: SCHL), the global children’s publishing, education, and media company, visit the Company’s media room: http://mediaroom.scholastic.com. For more information about LitWorld, visit: https://www.litworld.org.